1) Go to app.mobiusSLIP.com and click on the right side. 2) Enter the enrollment code and your school email address in the spaces provided. And don’t forget to enter the Captcha Code provided and then click . 3) You’ll receive a message that we have emailed you a confirmation that you’ve created an account in Mobius SLIP. If so, then access your school email and click the link to confirm your account. Remember to check your Spam folder if you don’t receive the email. Note: If, by chance, you see a message that says that your email address is already in use, then don’t panic, just check out the steps to register if you already have an account. 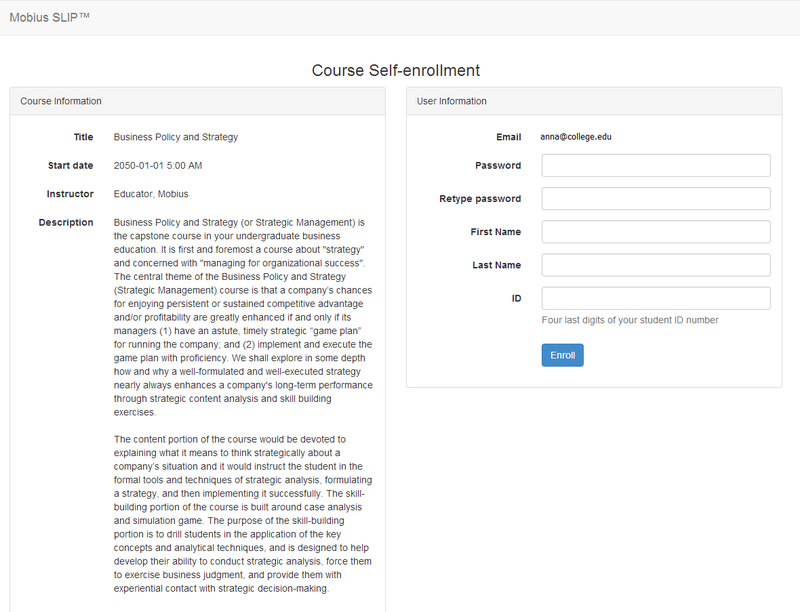 4) The link you clicked on takes you to a page that shows the course title and description on the left hand side. Review those before proceeding to make sure that you are enrolling in the correct course. It is much easier to get into the right course now than to have the Mobius SLIP Support team switch you into the correct course. 5) Simply enter a password, confirm it, and tell us your first name, last name, and the last four digits of your student ID to finish creating your account. 6) Click . Presto, you are in. You are then redirected to your My Courses page. See the Payment Information section and follow the steps to pay for your course.